Soundhealing is based on the principal that all matter vibrates on its own specific frequency. In the body every cell vibrates, every tissue, every organ vibrates on its own vibration. Powerful sound-vibrations made by the voice and all sorts of instruments have the ability to balance impure frequencies. Sounds have the power to break through any form of energy barrier, therefore the force of sound is used in healing for physical and emotional blockages. I use the sound of my voice and of the instruments as a vehicle to transfer my intentions to you and to fortify your intention: frequency + intention= healing! During a treatment I take you on a journey in yourself. The purpose of this journey you decide with your intention. Using Shaman drums and old Icaro's (spirit songs) we descend into the darkest places of your unique light-being. From this light state of trance you get more sensitive to the sounds and you'll get more notion of the healing taking place. I tune myself in to your personal energy en needs of that moment en guide your inner journey with my voice, my hands, a lot of instruments and a lot of ... love. Being open, being relaxed, letting go, connecting with your true self, dreaming and enjoying, all of this too is experiencing the beauty of your true self. These soundhealing sessions can be done individually or in a group. 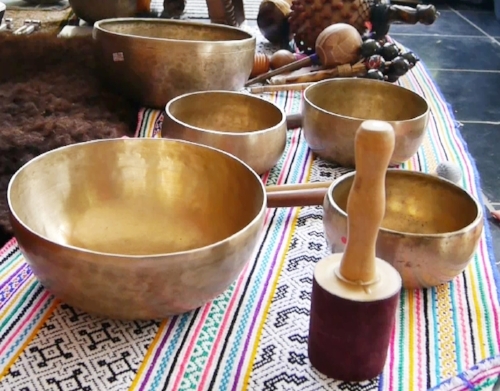 We also offer a formation to learn the art of being a Soundhealing Practitioner. You'll learn to listen to the silence in the sound, to work with the different frequencies produced by a large variety of instruments and off course the voice. And you'll get to know 'your true self' a bit more, for this last skill isn't learned overnight. We'll help you open the door, but it's up to you to walk through and to begin this journey inside. The only thing you'll have to master in any form of healing is 'yourself'. More about this formation you'll find by visiting our page about this magical course. Like we mentioned before, there are different treatments in our work and even in this section of ‘soundhealing’ there are different combinations to make. You can take a long session, where we take more time to talk and work deeper with the sound and breath, or you can take a short relaxation session, where you let yourself be filled with the vibrations. After our little talk we like to start of the Soundhealing with a session of Breathing sounds. This is a breathing session, like a ‘rebirthing’ session. We’ve put the rebirthing sessions in a new format but working with the spirits of the Rainforest, through shamanic healing and singing. This way of breathing can take up to one hour, and from there on you’ve put yourself in a very deep state of consciousness from where we continue the work with the sounds. You’ll be much more receptive for all the frequencies. With Duo session we mean 'more than just you'. Different possibilities are at hand. You can attain a session with your partner, friend, family member, so it will be a duo-treatment. Or you can have a session with two people working on you. Ex: Juanita can give a massage while Marijn is making music. Different combinations are possible. You can also ask for a small group session at your place for family or friends. Don't hesitate to ask, we'll find the suited combination for you. In these sessions we bring in the spirits of the plants. Similar to the other ‘soundhealing’ and ‘Icaro’ work, where we work with energetic blueprint of a plant-spirit through songs and energy, but now we use the actual plantspirit to enforce your personal work. These sessions you don’t jump in to from the first time. We will advise you to take breathing sounds-session first, and after some time we can start this kind of work. It takes a lot of effort and asks from you a good discipline and focus. You’ll have to go on a special diet, to be able to make the subtle contact with the plantspirit. Witch plant to use, we’ll talk about during our intake conversation. We only work with masterplantteachers, that can mirror our deeper feelings and our habits, and will give us the power to rise above them and overcome our difficulties, so we can continue our path...forward.